Offering you a slow take on dinner. Easy crock pot recipes, and more homemade meal ideas at the bottom of the page. Spray a large crock pot with vegetable oil. Add the cream soup, onion soup mix, beef broth, garlic powder, onion powder; whisking until smooth. Season to taste with salt and pepper. Place the roast into the crock pot and spoon some of the mixture over the roast. Cover and cook on high for 5 hours (8 hours on low). If the roast is frozen, cook on high for 8 to 10 hours; or until meat falls apart. 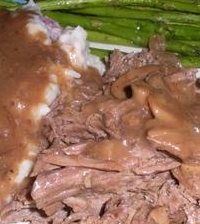 This is another awesome Crock pot Recipe, and we have it frequently. Why? It's just a dynamite easy slow cooker recipe; easy to prepare and delicious. 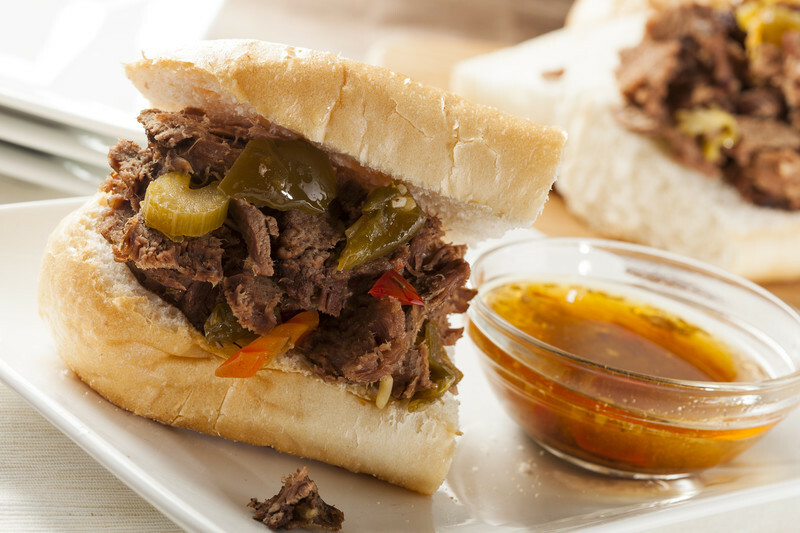 My secret to My Best Italian Beef Sandwich recipe is my homemade Italian dressing mix; recipe below. Add the entire jar of peppers to the broth and give it a quick stir or two. Carefully add the beef roast and finally measure out two servings of the homemade Italian Salad Dressing mix and sprinkle over the roast and in the broth. Toast the buns if you wish in the oven and dunk half of the bottom bun in the broth. Fill with the shredded meat, add the sauteed peppers and onion and top with cheese. Place under a broiler until the cheese is melted. Is your mouth watering now? It should be. Also fantastic with mashed potatoes. Here's an easy crock pot recipe. No leftovers. Even more delicious, serve with garlic bread and a fresh green salad. You may add black olives or whatever you want; even additional seasoning. In a heavy skillet, cook the ground venison with the onion. Add the pasta sauce (spaghetti sauce), mushrooms, sweet basil, oregano, garlic and onion powder. Season with salt and pepper to taste. Spray the crock of the slow cooker with vegetable oil and place 1/3 of the meat sauce down on the bottom, followed by 1/3 of the buttered noodles, then 1/3 of the sliced pepperoni, and sprinkle with 1/3 of the cheese. Repeat. Cook on low for 3 to 4 hours. Serve with garlic bread and salad.